As a matter of philosophy, our firm does not defend insurance companies. We accept only plaintiff cases. Our St. Louis surgical error attorneys are committed to keeping families safe by advocating for better medicine and better treatment for seniors in long-term care facilities. Our St. Louis defective product attorneys support the implementation and use of safer machinery and consumer products, enhancing safety in the workplace, in our schools and on our roadways. Our St. Louis product liability lawyers help ensure that the powerful are accountable to average citizens who make purchases in good faith. 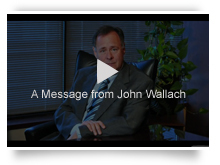 At the Law Office of John S. Wallach, P.C., we believe that every client deserves our full attention and commitment. For that reason, we limit the number of cases we handle at any one time. Personalized, hands-on case management is a major factor in our long-standing success. Attorney Wallach has appeared in state and federal courts located throughout Missouri and Illinois. He has successfully resolved hundreds upon hundreds of cases by way of jury verdict and settlement, as well as through alternative dispute resolution, including arbitration and mediation. In addition to achieving tangible success for clients, Attorney Wallach has been AV® Preeminent™ Peer Review Ratedby Martindale-Hubbell® since 1990 and can be found in the Martindale-Hubbell Bar Register of Preeminent Lawyers™ in the Medical Malpractice and Personal Injury practice areas. This rating, bestowed by our colleagues at law, is a reflection of expertise, experience, integrity and overall professional excellence. Most of our clients come by way of referrals from other attorneys who are familiar with our work and agree that we uphold the highest professional and ethical standards. Your personal injury case deserves the most professional advocacy available. To schedule a free initial consultation with a St. Louis trial and medical malpractice attorney at the Law Office of John S. Wallach, P.C., call us at 877.241.1020 or contact our office online.